This is another card in which the inspiration came from one of Christina's video tutorials, it's an A5 card with the sentiment printed onto Spellbinders Labels Twenty. I embossed some white Centura pearl card stock with the Cuttlebug simple flowers folder and the border on the bottom of the card is from the Spellbinders Parisian Accents die set. The flowers are made up from Spellbinders Spiral Blossom One and Bitty Blossom set and I also used the foliage die, bling and ribbon from my stash. I love the color of this card and those dies look just fabulous... and the beauty of Spellbinders is hey will never date and go out of fashion. So although this was a set I told readers about a good few years ago they are still as fresh and pretty as they were then. 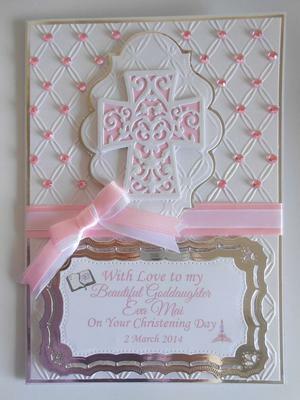 This card is so beautiful and I love the pink and white. It looks clean and fresh and those diamante on the cross section look so special. 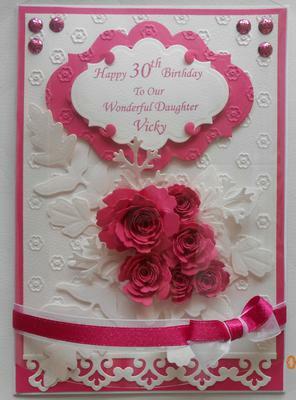 Any embossing folder with this type of pattern on it can be dressed in this way and it makes a real difference to the look and finish of the card. I am not surprised that you are pleased with it and it will become a "Keepsake" for the future.